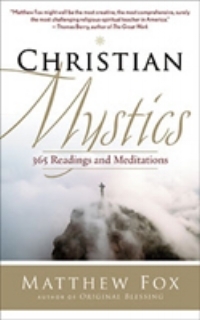 CHRISTIAN MYSTICS: 365 READINGS AND MEDITATIONS tells how traditional Western educational systems have neglected mysticism since the 16th century, offering instead an academic approach to religion and the soul. This collects a variety of quotes from Christianity’s greatest mystics over the past two thousand years, exploring and celebrating the mystical path of Christianity over the last two thousand years and offering commentary on these revelations. Christian collections will find this inspirational and unusual. Fox (Original Blessing), harassed and finally expelled from the Catholic Church and received by the Episcopal Church, presents here a kind of meditated notebook that collects brief passages and insights from some of Christianity’s great thinkers and mystics, including St. Thomas Aquinas, Julian of Norwich, Thomas Merton, and Howard Thurman, enlivened by Fox’s commentary. Fox is widely regarded as one of the most transformative Christian theologians of the last 50 years, and with these illustrative notes on the mystics he never loses sight of his abiding interest in the goodness of created existence. VERDICT A wide-ranging selection of excerpts, with Fox’s typically challenging observations and questions; good for the individual reader, whether student or pastor. The following questions are often included in interviews with Matthew Fox. Mysticism is our deep experiences of unity—with nature, with music, with friends, with truth, with God. It is a work of the right brain more than the left brain; it is the essence of authentic religion and it is about experiencing, not intellectualizing. “Taste and see the Lord is good” says the Psalmist. Mysticism is about tasting. No one can do it for you. What is the relationship between fundamentalism and mysticism? Fundamentalism, unfortunately, tends to be more about rules and order and control than about mystical experience. It is often an enemy of mysticism. You say that a lack of mysticism is what makes religion boring. Why? Mysticism provides breakthroughs in consciousness and is often the basis of new, deep and creative breakthroughs. Religion without mysticism degenerates into rules and laws, dogmas and words and control compulsions. The left brain takes over and renders experience dull and unimportant. You say that deep down we area all mystics. What is the key for connecting with the mystic within? The key to connecting with the mystic within is to trust one’s deep experiences whether of Awe or of Silence, of suffering or of creativity, of justice-making and compassion. True mysticism leads to justice-making and the practice of compassion. How did you choose which mystics to include in the book? I paid special attention to those who are pre-modern such as Aquinas, Hildegard, Mechtilid, Eckhart, Julian and Cusa because post-modern times need pre-modern wisdom. And I paid attention to Jesus and Paul of course but also to twentieth century mystics who share sensibilities around current issues such as science and spirituality, sexuality and spirituality, ecology and spirituality, deep ecumenism and spirituality..
Do you have a favorite mystic?If so, who is it and why? I have special regard for Hildegard, Aquinas and Eckhart because, being pre-modern, they were intent on linking science and spirituality and also justice and mysticism. If I were pushed to name one it would probably be Eckhart because he does such a breath-taking job of marrying art and creativity with mysticism and also justice and compassion with mysticism. And he walked his talk and was condemned by the corrupt papacy of his day for doing so. I also have favorites among the twentieth century mystics however including Dorothee Soelle, Fr. Bede Griffiths, Thomas Merton, Fr. Tom Berry, etc. What is the difference between Mystical Christianity and regular Christianity? Mystical Christianity begins with experience and leads to experience. It encourages creativity and the work of Spirit rather than excessive dogma and structure and control and institution-building. It honors the presence of Spirit in nature, in sexual sharing, in art and music and architecture and creativity in its multiple expressions. It practices silence and is not afraid of solitude. It is both personal and communal and it finds its full expression in service and work of justice-making and compassion. It also looks to make connections with the mystical practices (such as meditation) of other traditions than one’s own. In your opinion, how does religion in Western culture need to change? It needs to become less institutional, less about the religious-ego, and more about spiritual experience. Less about church and more about community. Less about “us” and more about kinship with all beings; less about the upper chakras of words and thinking and the rational and more about the lower chakras which are about dance and vibration and generativity and connecting to the earth and the cosmos. You say that mystics teach us to be “drunk with love.” What do you mean by that? Mysticism encourages letting go, getting high, expanding one’s consciousness, allowing joy to explode, going to the edge. As John of the Cross put it, “launch out into the deep.” Too many people are standing on the shore. Are nature and mysticism related? How? Most people I have interviewed over the past 40 years have their most powerful mystical experiences in nature and in studying nature. That should be no surprise since awe resides deeply in nature. That is why science can lead us to a deeper experience of mysticism and is no enemy of religious experience but an ally. Which is more important — consciousness or technology? Why? Rabbi Abraham Heschel observed that “Humanity will destroy itself not from lack of information but from lack of appreciation.” Expansion of consciousness is necessary for knowing how to steer technology and what technology’s deepest uses are. Technology, like everything humans give birth to, can be used for good or ill, for creation or destruction. Consciousness guides us into wise use of technology. Without it technology just ups the ante on human destructiveness. Who or what is the Cosmic Christ? The Cosmic Christ is the Christian archetype for the divine image present in every being, indeed, every atom in the universe. It is the “light in all things.” It is also, with its incarnation in Jesus, the wounds in all things. Divinity is both the light and the wounds in all things. All beings are other Christs therefore. And every human is meant to be another Christ. Do you consider yourself a mystic? Why or why not? I suppose so. I would not be qualified to write about mysticism if I was not in some way practicing what I preached. What role does silence play in mysticism? Is it important? Why?